criterion for the same. CTET JULY 2019 exam has been assigned to be conducted by Central Board of Secondary Education (CBSE) on 16th September, 2019 whereby candidates get facilitated with an eligibility certificate for the appointment of a primary teacher for class I-V and upper primary teacher for class VI-VIII as per the merit. 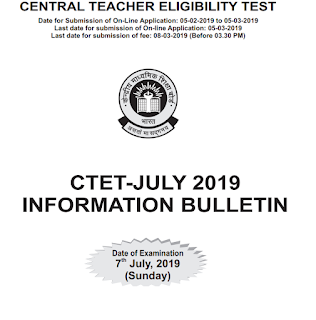 CTET JULY 2019 Exam is conducted every year across the country to fill all the vacant positions in all central schools. It is to be noted that schools under the Union Territories of Chandigarh, NCT of Delhi,Dadra & Nagar Haveli, Daman & Diu and Andaman & Nicobar Islands and Lakshadweep readily consider CTET score for placing teachers into their schools. Beside government divisions, the unaided private schools may also put to use CTET Score as means of absorbing teachers into their respective schools. Any state government if fails to conduct State CTET for a particular year , avails the option of considering CTET for employing teachers. National Council For Teacher Education (NCTE) has been authorized as the official governing body regulating various benchmark of eligibility and standard in accordance to the syllabus and exam pattern with regard to the TET exams. 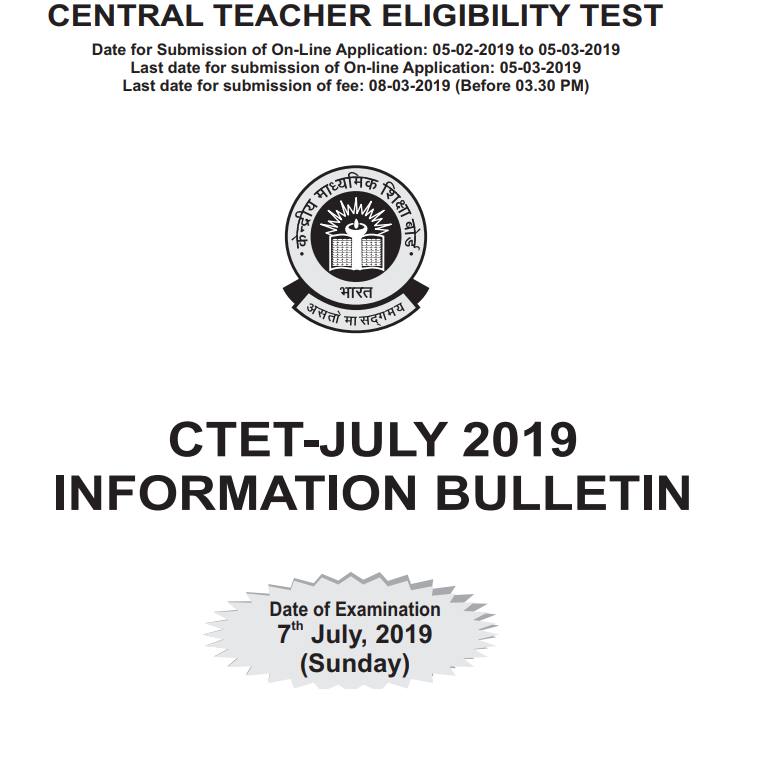 Below is the detailed information with regard to CTET JULY 2019 exam, eligibility criteria, application process ,fees etc. Note: One has to qualify both the papers in order to avail teaching from Class 1 to 8. A minimum of 60% score is requisite for qualifying the TET and become eligible for appointment as a teacher. The TET qualifying certificate issued is valid for next seven years from the year of appearing. There is no attempt limit imposed to sit for CTET exams, one can appear as many times as to improve score every year. CBSE conducts the CTET exam in two sessions. Paper-I exam in the evening session (2.00 pm to 4.30 pm). Note: Time allotted for each paper is 2:30hrs. Have passed Senior Secondary or its equivalent from a recognized school with at least 45 percent marks and possess two-year Diploma in Elementary education/Four-year Bachelor of Elementary Education (B.El.Ed)/Special Education. Must be a Graduate in any discipline (B.A./B.Com/B.Sc) and possess two-year diploma in Elementary Education/Bachelor in Education (B.Ed)/Four-year Bachelor of Elementary Education (B.El.Ed)/Four-year B.Sc. Education or B.A. 2) Click on the link "Apply On-line" — an new page will show up. 4) Fill the details carefully in the online application form Part-I and secure the registration number. 5) In the online application form Part-II, upload scanned Images of latest photograph and signature. 6) Make the payment online through Debit/Credit Card or download e-challan for offline mode of payment.